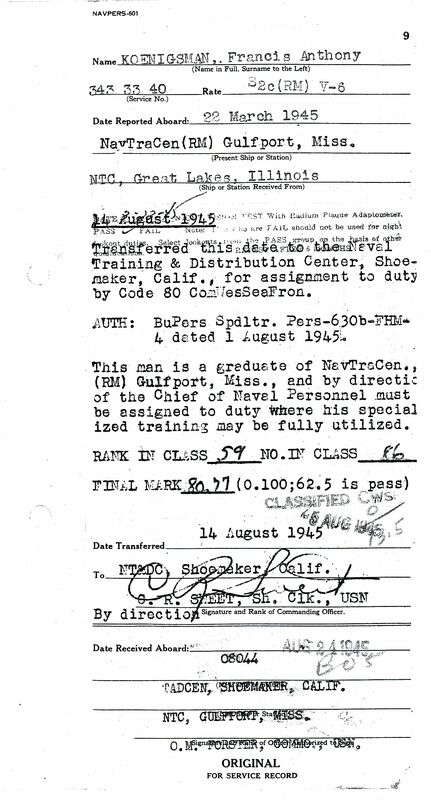 Frank’s next transfer occurred on Tuesday, August 14, 1945 when he was officially transferred to the Naval Training & Distribution Center (TADCEN), Shoemaker, Alameda County, California for "assignment to duty by Code 80 ComWesSeaFron" (Commander, Western Sea Frontier). The transfer noted that "This man is a graduate of NavTraCen., (RM) Gulfport, Miss., and by direction of the Chief of Naval Personnel must be assigned to duty where his specialized training may be fully utilized." 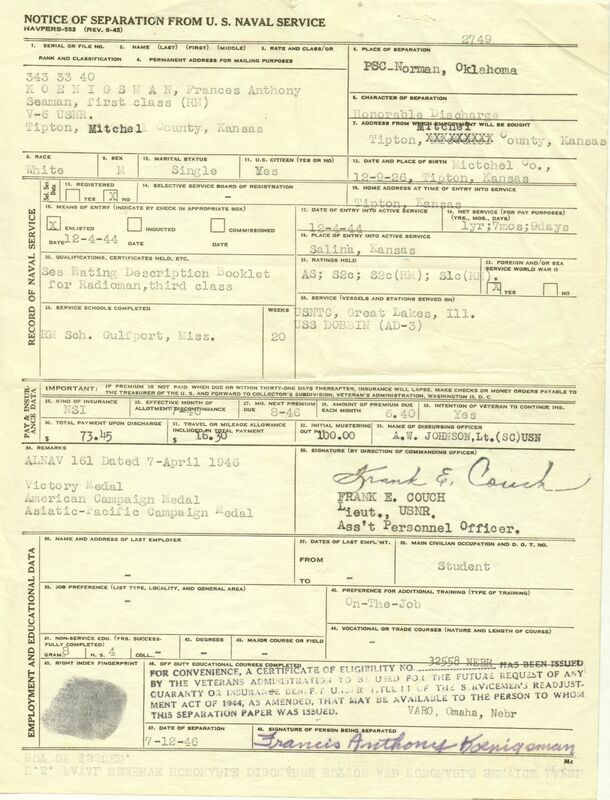 Prior to arriving in California, Frank was awarded 5 days "Delay Leave" from 19-Aug-1945 to 24-Aug-1945. 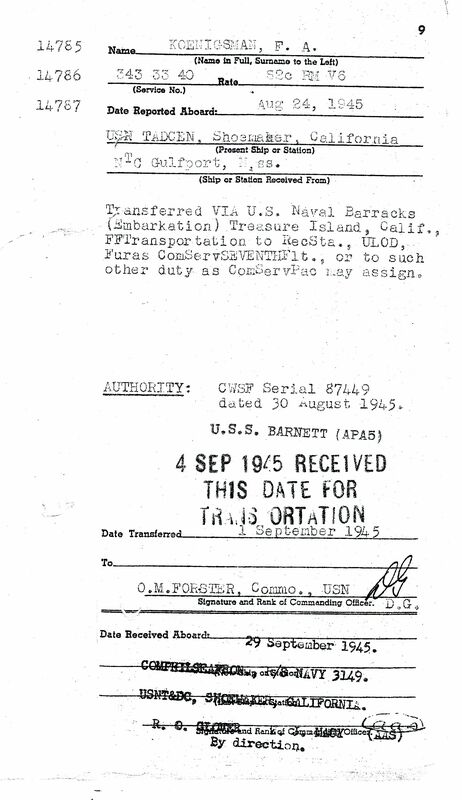 Frank was officially Received Aboard at TADCEN, Shoemaker, California on August 24, 1945. 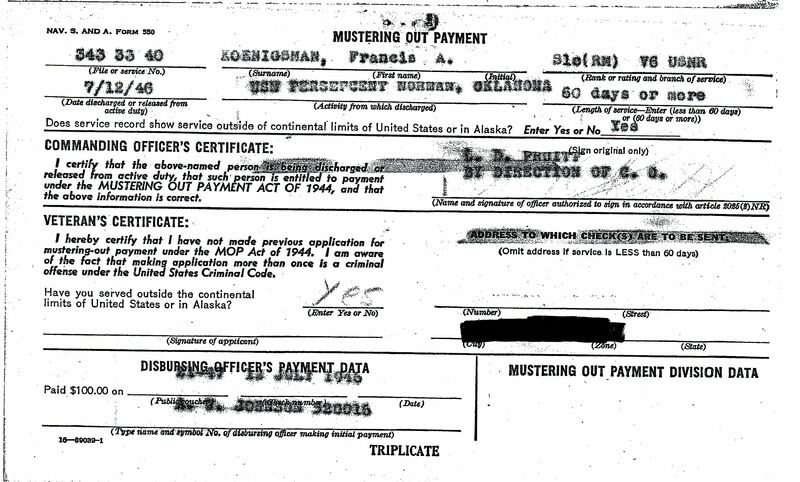 Then again on Saturday, September 1, 1945, Frank was transferred via U.S. Naval Barracks (Embarkation) Treasure Island, California to Receiving station, Samar Philippine Islands, for further assignment to the Commander, Service Forces, 7th Fleet. 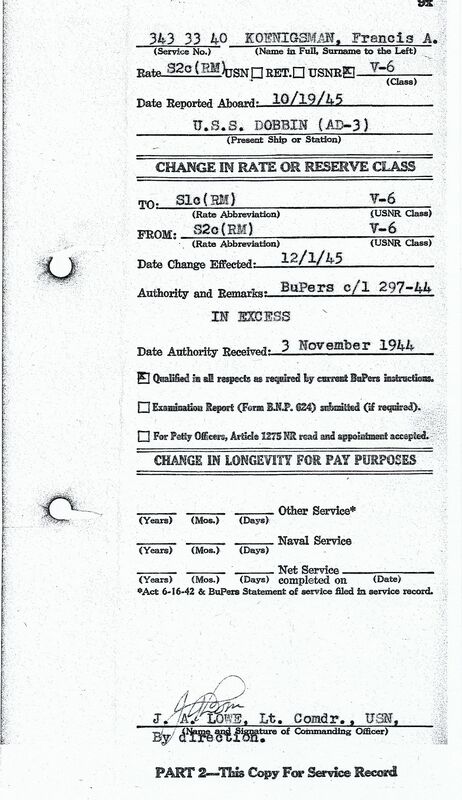 The official orders used the military abbreviation terminology "Recsta., ULOD, Furas ComServSEVENTHFlt." 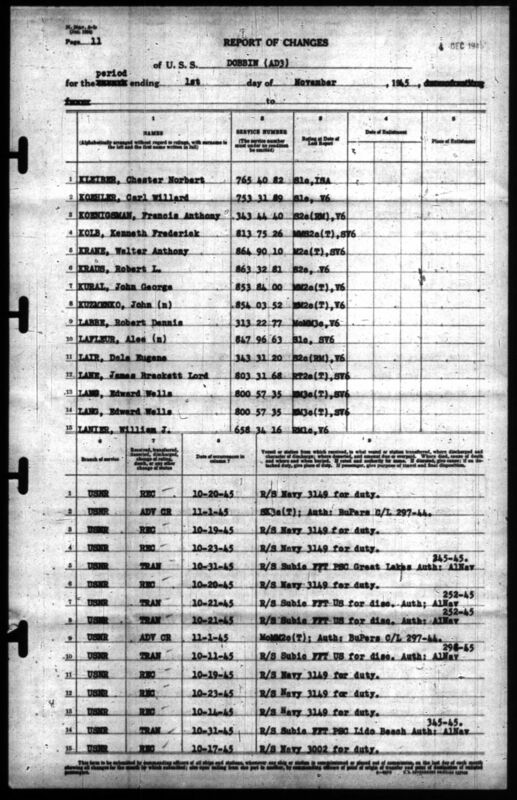 [Translation: "Recsta" = Receiving Station; "ULOD" = shipping destination code for Samar Philippine Islands; "Furas" = For Further Assignment; "ComServSEVENTHFlt" = Commander, Service Forces, 7th Fleet.]. Frank borded the Troop Transport ship U.S.S. 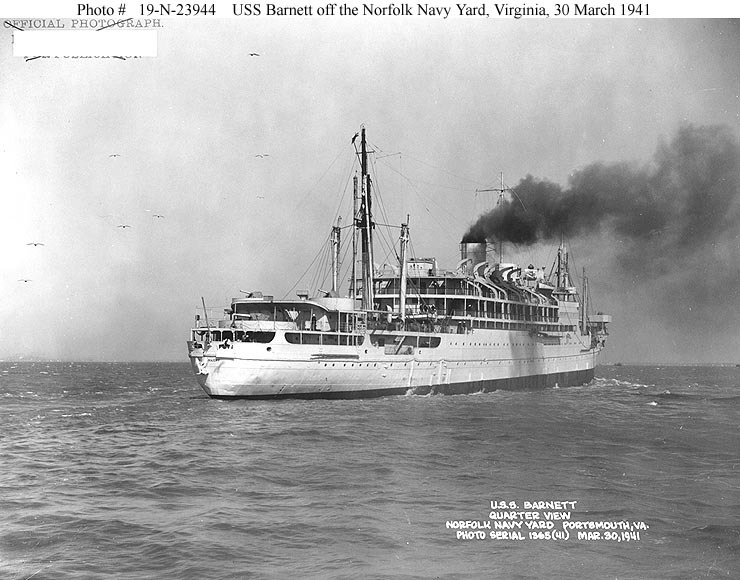 Barnett (APA-5) for transport to the Philippines. According to the Dictionary of Naval Fighting Ships, "On 4 September, Barnett embarked occupation troops and set sail for the Philippines. Arriving at Samar on the 26th...". 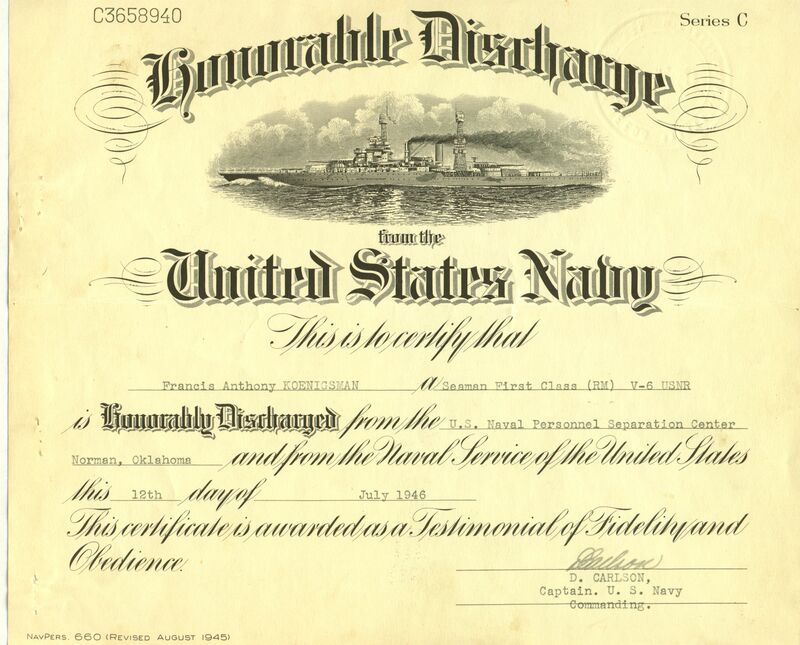 He was officially received aboard COMPHILSEAFRON (Commander, Philippine Sea Frontier) on Saturday, September 29, 1945 and then on Tuesday, October 16th was assigned to the U.S.S. 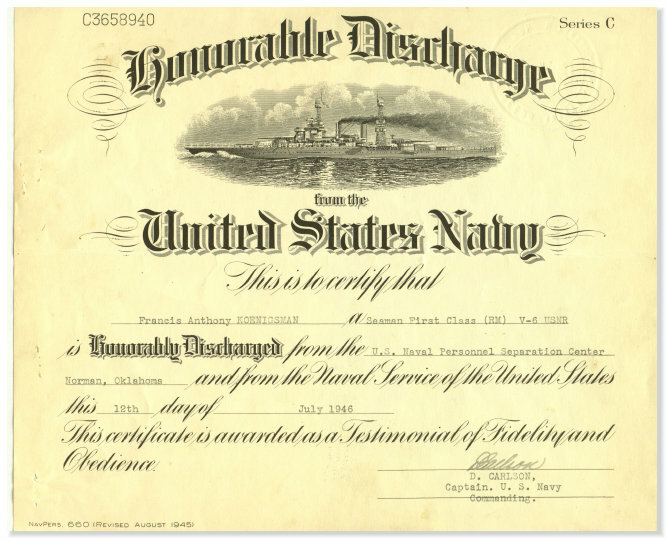 Dobbin and transported via the Naval Air Transport Service from Samar to Sancley. 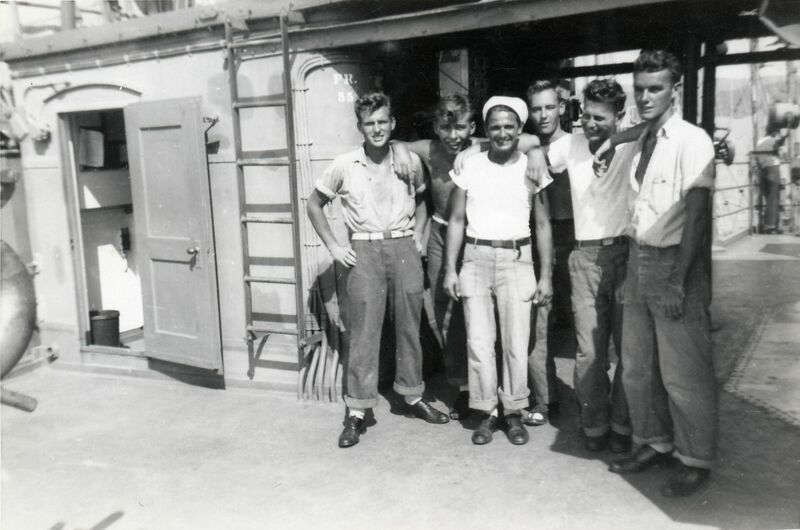 Frank finally reported aboard the Destroyer Tender U.S.S. 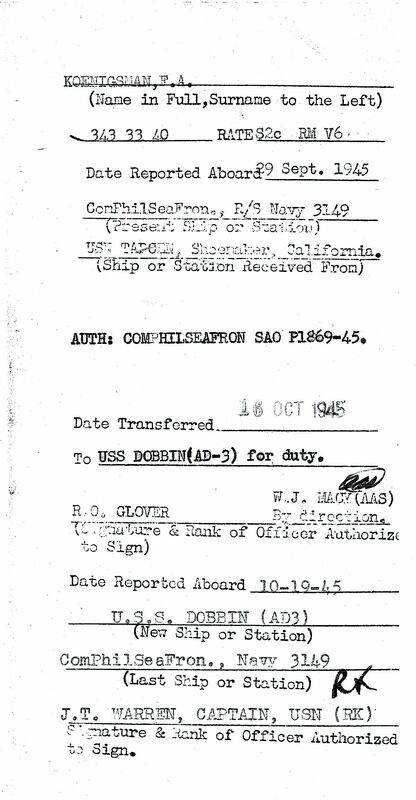 Dobbin (AD-3) on October 19, 1945, a Friday, while she was in Subic Bay, Philippine Islands (P.I.). Subic Bay is a bay of Luzon Island and is part of the Zambales Province. 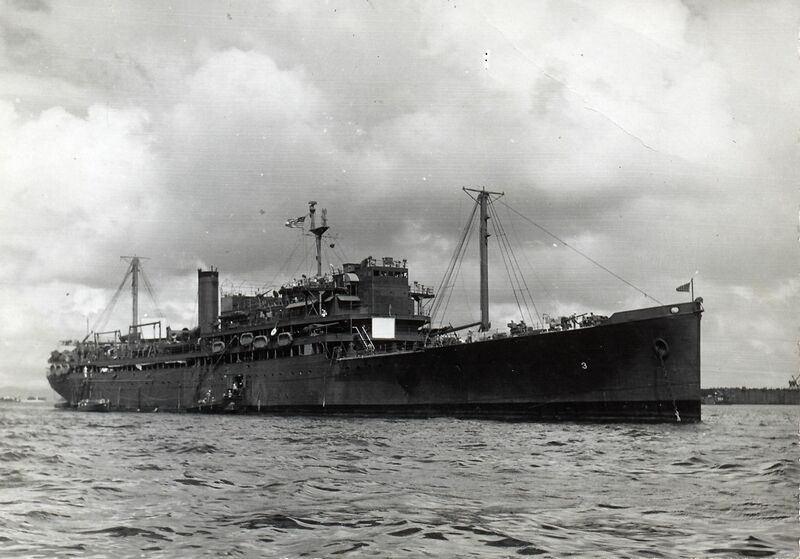 Just two weeks laterDobbin left Subic Bay around November 2, 1945 and transferred to Leyte Gulf, P.I. 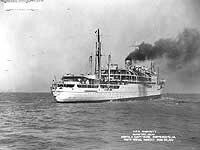 (Leyte Gulf forms the eastern edge of Leyte Island and the southern end of Samar Island) before leaving the Philippines around November 13th and returning to San Diego, California on Friday, December 7, 1945. 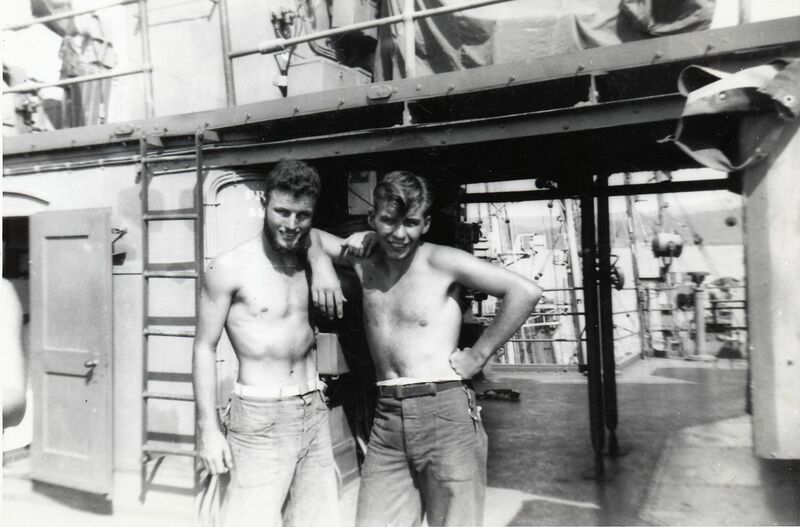 While on the return voyage to the states, Frank was promoted to Seaman First Class, Radio Man (S1C(RM)) on December 1, 1945. 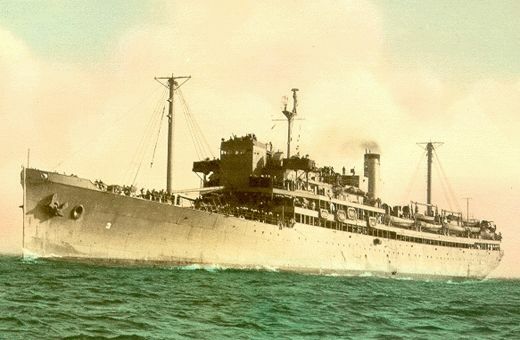 Destroyer Tenders, such as the Dobbin, are auxiliary support ships that service and supply destroyers. 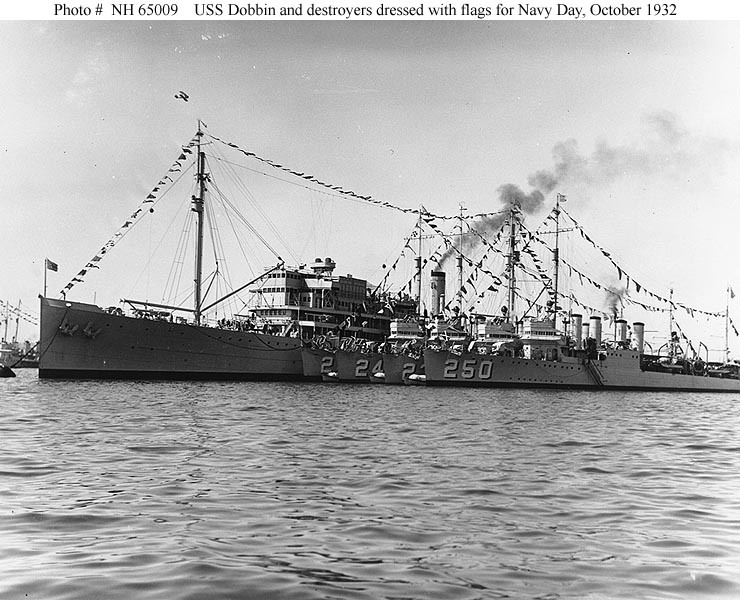 Frank said that the Dobbin carried a machine shop with tools and equipment capable of manufacturing any part needed on a destroyer. bridge of the ship (Dobbin)"
"The Hot days on Subic Bay"
This was taken in Samar Phillipines I.
the day before we left for the states. After returning to the states, Frank remained stationed aboard the Dobbin for another seven months while she was docked in San Diego. 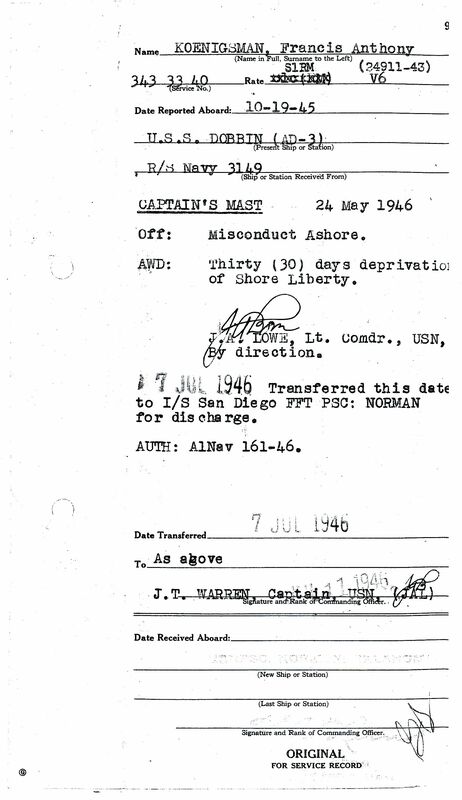 While stationed in San Diego, he must have had a little too much free time on his hands because on May 24, 1946 Frank was charged with the offense "Misconduct Ashore" and awarded "Thirty (30) days deprivation of Shore Liberty". For his Naval service, Frank was awarded the Asiatic Pacific Ribbon, American Area Ribbon and World War II Victory Ribbon. 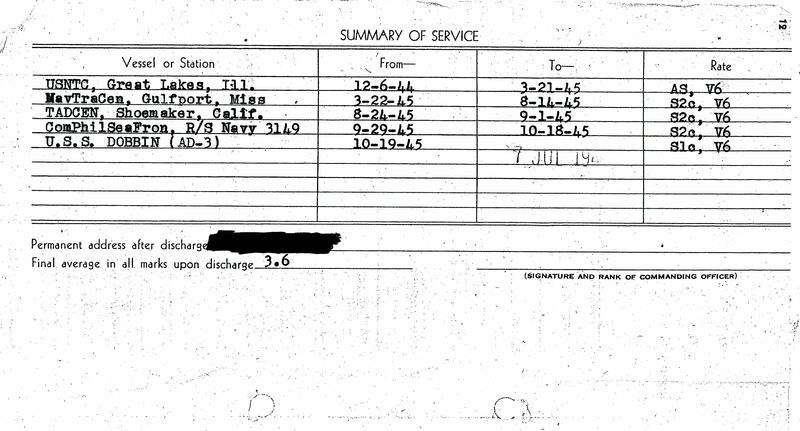 On July 7, 1946, Frank was transferred to I/S San Diego for further transportation to the Personnel Separation Center (PSC), Norman, Cleveland County, Oklahoma for discharge. 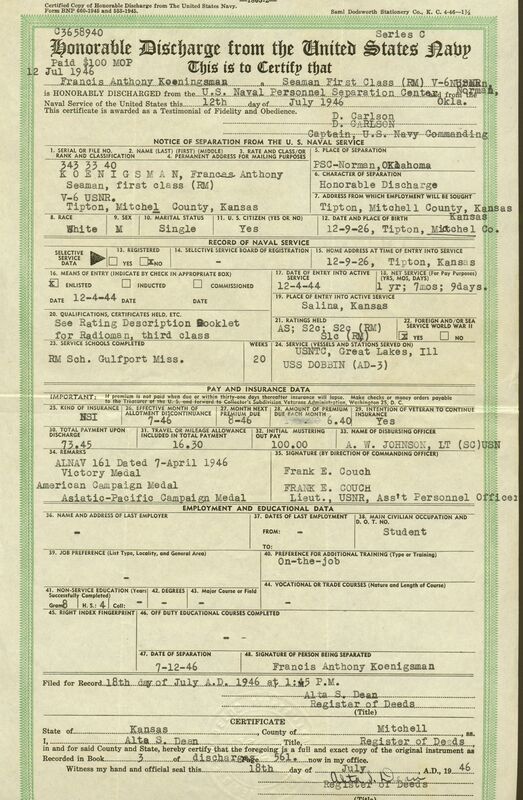 Frank was officially Honorably Discharged on Friday, July 12, 1946, having served 1 year, 7 months and 9 days. Awarded to any member of the United States military, including members of the armed forces of the Government of the Philippine Islands, who served on active duty, or as a reservist, between December 7, 1941 and December 31, 1946. Destroyer Tender U.S.S. 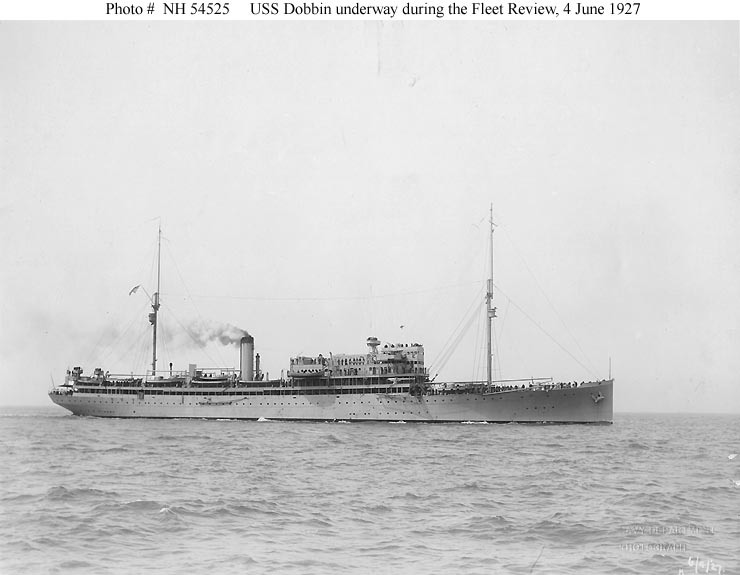 Dobbin (AD-3), named for James Cochrane Dobbin, was launched 5 May 1921 by Philadelphia Navy Yard and commissioned 23 July 1924. She served in both the Atlantic and Pacific oceans between her launch and the beginning of WWII.